Unless you’re living under a rock, you know that United retired its 747s last week with one remarkable last flight. I was devastated that I was unable to go due to other commitments, but United allowed me to send someone in my place to cover the experience for the blog. David Hotz helps to feed my unhealthy 747-tribute obsession with this report. The 747 is one of the most recognizable aircraft in the sky, and that has spawned all kinds of nicknames including Jumbo Jet, Humpback, Fat Albert, and Big Boss. No matter how you refer to this breathtaking jet, we more and more can only call her… gone. These elegant birds are sadly disappearing with United Airlines being the latest to retire the plane from its fleet. When it comes to nicknames, I prefer the regal Queen of the Skies, so it was fitting that I was able to be a part of a retirement flight that was indeed fit for a queen. The airline pulled out all the stops and threw an amazing party to celebrate all that the 747 gave to the airline by recreating its first route flown over 47 years ago from San Francisco to Honolulu. While I wasn’t born when United ran this route for the first time (many others don’t remember the 70s for other reasons), I was lucky to be invited to fly along. I arrived at the airport and walked through security just as any other traveler. Long before I got to the gate, I could see United had #UA747Farewell signage up.. Looking down the long corridor of a relatively sleepy Terminal 3, I could already feel the excitement coming from gate 86 that drew me in and immediately gave me a jolt of energy stronger than any cup of coffee. For a few hours, strangers mingled as friends – sharing 747 experiences, taking pictures with the 70s-retro backdrops and signing the jumbo-sized retirement card. Captain Dave Smith, who flew the last flight, handed out copies of the flight plan and posed for pictures. Thirty lucky United employees won raffles to be on the flight and told their stories to enthusiasts, whose love affairs with the 747 go back decades. Some dressed in a 70s theme (one even winning a $250 United gift card for his outfit), however this Cranky correspondent was lamely in a sweater and khakis. A consistent theme among all speakers was that the 747 brought people closer together. The Boeing 747 Program Manager showed a picture of him at 8 years old boarding a United 747 and talked about how he was awestruck that he would be boarding such a beautiful plane. A Pratt & Whitney VP talked about the bond that anyone who built, flew or maintained the plane would always have with one another. He also mentioned that it was fitting for this group of companies to work together since United, Pratt & Whitney, and Boeing at one point were all the same entity. A state senator and the CEO of San Francisco Travel hit on similar themes. Everyone who spoke mentioned how this end brought new beginnings. Boeing and Pratt & Whitney representatives gave sales pitches about the new planes and engines that would take over for this newly-retired plane. Once that was finished, people started lining up like they were boarding a Southwest flight. I think I even heard a moo as we got into cattle car formation. A buzz arose throughout the crowd as Oscar scanned the boarding passes of the first few passengers – including 18-million-miler Tom Stuker. (This guy flew so much that he had a 747 named after him.) United 747 Farewell swag bags met everyone at their seats, and Oscar helped the crew hand out mai tais. The crew finally wrangled everyone into their seats. Upon the 1 minute early pushback, everyone broke into applause. Hundreds of employees gathered on the ramp to take pictures and wave goodbye. We reached the end of the runway…and we sat. After about 15 minutes, Captain Smith informed us that they were working on a paperwork issue before departure. A rumor floated in the cabin that someone listening to ATC (Channel 9, the way United allows travelers to listen in on the cockpit conversation with air traffic control) wasn’t on at that point) said that there was a maintenance issue. Ten minutes after that, we were informed that one of the air conditioning packs wasn’t functioning correctly and that we’d be heading over to the maintenance hangar. Earlier the captain had announced that they would be playing the Halfway to Hawaii game, and at this point the purser came across the intercom and said that one of the passengers asked if we’d be playing the “halfway to takeoff” game. Somehow they figured out a way to fix the issue, and about an hour after pushback we launched into the air. We turned to the right after departure and did a Golden Gate Bridge fly-by at 3,000 feet. Gasps were heard throughout the cabin, and people leaned over to try to get photos. As soon as the seat belt sign went off, everyone was up and about chatting with newfound friends. Flight attendants struggled to make it through the aisles to hand out glasses of champagne for a plane-wide toast. Captain Howard Attarian, Senior Vice President of Flight Operations, spoke for a moment before plastic glasses were clinking from rows 1 to 60. No-one was in their seats and few were in their assigned class of service. There was a rush to fly by the 70s-retro-dressed flight attendants to sneak a peek at the upstairs cabin. The 70s theme continued in more surprising ways — coach even got a full meal service — but it took flight attendants promising a full bar service for people to actually return to their seats. It was certainly a party atmosphere from the beginning to the end. After the meal service, people were back out of the seats, talking, sipping on mai tais, and walking around the plane. One couple even got engaged (United later announced it was picking up the flights for their honeymoon). The 5-hour flight went amazingly fast and before we knew it we were being told to get back to our seats. The Captain announced we’d be doing a fly-by of Maui. You can see below the comparison of our approach to Honolulu to that of the United flight that arrived less than 2 hours before ours. In spite of the hour mechanical delay and the unusual departure and approach paths, we only arrived a bit late. At this point Channel 9 was on, and Honolulu Tower was heard asking if we wanted a low approach. I guess the late arrival was in the head of the Captain, as he succinctly said “negative.” Applause again broke out upon one of the smoothest landings I’ve ever experienced.. The party wasn’t over, however. Every passenger was greeted with a lei. More importantly, the plane itself also received a lei made out of hundreds of trash bags by the Honolulu ground crew. Our flight was met by the Governor of Hawaii and other local politicians. All were appreciative of the 747, but they really focused on thanking United for its 70+ years of service from the islands to the mainland. The Boeing 747 Program Director spoke again, this time talking about the effortless elegance of the plane and the bright future of United’s new Boeing orders. At this point, the festivities came to an end and people started to disperse. A surprising number of people were turning around right then or later that night to fly back to the mainland. One even was taking a 4:20pm departure to head back to Newark and go to work the next day. This is just one of the many examples of the devotion that the passengers of United flight 747 felt to the plane. All the speakers were right that the future of air travel is bright, but for one day, it was glorious to go backwards and celebrate one of the most significant innovations in commercial aviation… the 747. David Hotz has always loved travel in general and specifically the airline industry. He started collecting airline timetables as a young kid and became the go-to travel guru for his friends and family once the ability to book online became a thing. In college, he started collecting frequent flier miles and remembers the joy of redeeming US Airways miles for a First Class ticket to Asia. The obsession has grown from there and he’s traveled all over the world redeeming miles and points. When not traveling, David enjoys sports, cooking, playing with his dog and planning his next trip. After spending many years in Washington, DC, David now lives with his wife in Nashville. 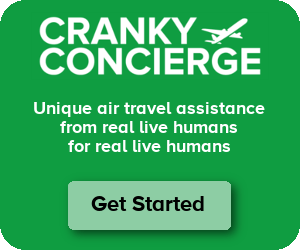 He is the Director of Flight Monitoring and Award Travel for Cranky Concierge. Did Braniff fly the Queen before United? Nope. Braniff started flying Jan 15, 1971. United was July 23, 1970. Well done David! Excellent and interesting report! The 747 never fails to catch my attention whenever I see it! I believe Pan Am flew it first. They were certainly the first to land one at O’Hare and I was among the thousands there to see it land gracefully and taxi oh-so-carefully to a hard stand! A wonderful aircraft! Thanks David! What a well-written article by David! My first experience on a 747 was a flight with Pan Am from Rio de Janeiro (GIG) to Miami (MIA) in 1981 just a few months shy of my 11th birthday. Our family sat in one 4-across middle row in turist class. Even though we had booked non-smoking seats, we were totally enveloped by cigarette smoke. Turns out the smoking section was NOT at the back of cabin, but the three seats along the right side of the cabin (something like seats H-J-K). So in the end everybody basically was covered in tabaco smoke and nicotine. The experience was not at all nice for me, since I never could stand the smell tabaco and/or nicotine. My last experiences with the 747 were in 2001 with Singapore Airlines on the 747-400 from Frankfurt (FRA) to Singapore Changi (SIN) and from SIN to London Heathrow (LHR). I have never received such good service in coach as on those two flights. Since the return flight was a day flight, I had the opportunity to observe the impressive wing flex on take-off for the nearly 12 hour flight to LHR. The wingtips flexed up way more than the hight of the winglets before the plane rotated for take-off. Since we had a delay of more than three hours, due to engine problems and having to wait for relief aircraft to arrive from Tokyo, the captain really pushed the throttles to make up time. This flight was schedule to go on from LHR to JFK. So for good part of flight over Asia the flight following channel showed a groundspeed of over 1,100 km/h. To say I was impressed is putting it mildly. On final approach into LHR in the late afternoon I was even able to see two Concords. What was overlooked is that this is a hull that’s being retired today, so it obviously flew until very recently. Which means United was actually foisting four-across seating on its business class customers recently. Only United… The Alitalia of America. Mark – BA does it too! I loved it, more chances for my systemwide upgrades to clear, since I work for a company too cheap to pay for business class on long flights! Very glad to see the United 744’s retired, as they were undeniably awful in the back (I made sure I managed to take one last flight ‘upstairs’, last year, as that was a completely different experience). My very first flight was in a 742, LHR-BOS, aged 11. They are, undoubtedly, beautiful planes, that leave a huge legacy – but in latter years they’ve been pretty uncomfortable in Y class, on any carrier that I’ve flown them with (even a 2-week old VS 744 in 2004). I must say United’s PR department did a good job on this as I’m tired of hearing about it. Living in the bay area, it’s been over played to death. But with that said, I like the 747 and sad it’s days are numbered as a passenger plane in the world. I’ve flown in a number of them over the years. Working for TWA back in the 80s/90s helped with that. +1. Starting to get creeped out a little actually. A lei of trashbags for the plane?, Aw did the plane smile? I love how the crew was lying to you (about the delay), right to the bitter end. Serious question though … what is happening to that plane now? I assume it is being scrapped for parts, but HNL doesn’t seem like a very convenient place to do that from. Did they just ferry it right back to SFO or PHX or something after this flight? Bgriff – It’s actually in Victorville. The airplane came back to SFO the following morning and then went down there. I wonder why they didn’t have the last flight be an HNL->SFO then? Just seems odd to force a 5-hour repositioning flight in. Maybe with the accumulating maintenance challenges of that fleet they were worried that a departure from anywhere but the SFO base might face maintenance cancellations. The point was to recreate the first flight, thus SFO-HNL. Though had they wanted to, I could see making the return flight the final one as a sort of “closing the chapter” story, starting with SFO-HNL in 1970 and ending with HNL-SFO in 2017. Davis M. That would have made the perfect bookend to the story. I just flew a KLM 747 from AMS to LAX Nov 12 in the upper deck Business Class section. Sweet ride!